I am the kind of woman who makes her own jam. I have been for about 10 years. I am not telling you this to impress you. For real. Making your own jam is possibly the most easiest recipe on the planet (ok...maybe not that easy, but you get my point). It doesn't even take a long time; maybe an hour? Even the sterilizing of the jars --often the most time consuming step-- is way-easy since my dishwasher has a sterilization setting. But you know what does make it impressive? The fact that I hand-picked each and every strawberry. 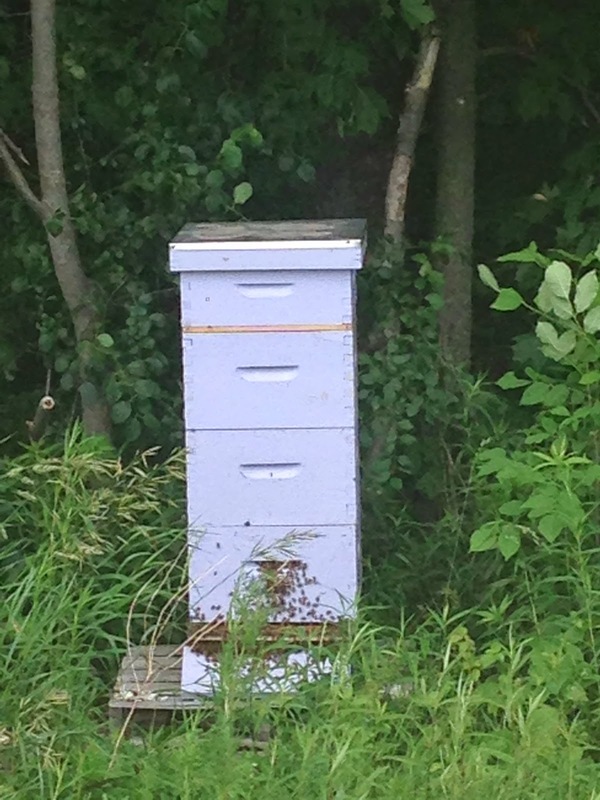 I wasn't lying about the bees. And they were organic. And I was surrounded by bees. And I accomplished all this picking, hulling, and jamming on Canada Day, making me pretty much the most Canadian person...ever! Ok. For real now. I don't make jam to impress anyone or because it's healthier, or because it's cheaper (because it's really not). I make my own jam because homemade jam really, truly blows even the most fanciest store-bought jam clean out of the water. It may seem unbelievable but I promise you that six months from now when we are once again in the midst of a the polar vortex, eating this jam will take you right back to those sweet summer days. Why else do I like making my own jam? 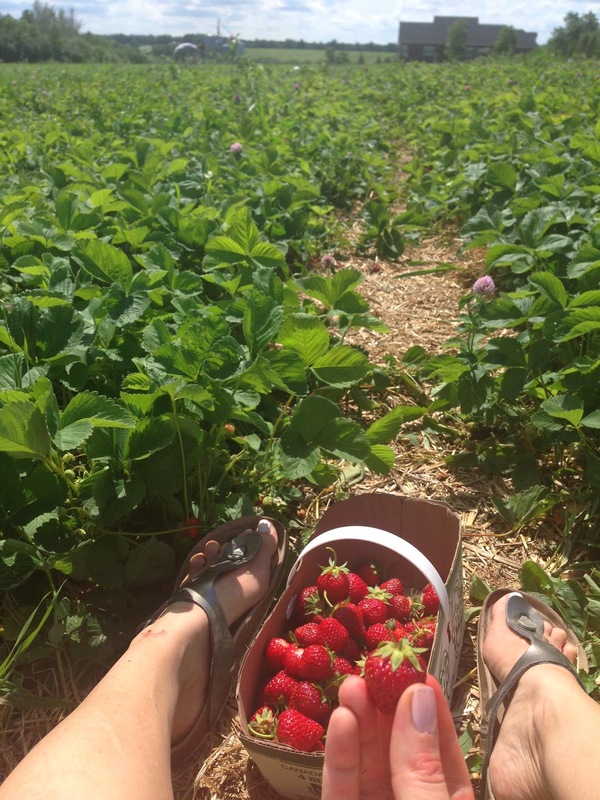 Because I love strawberry picking. I know that for most of you out there, it is one of those do-it-with-your-kids-on-a-Saturday-afternoon activities for one or two years, but for me, I never get tired of it. Even though my family got bored of coming years ago and I must now go it alone, each year I still look forward it. I swear, if you haven't ever been to a strawberry field on a warm, summer day you don't know what you're missing: it smells like fresh strawberry jam and the berries are warm and sweet and it's early in the season and the bees are busy doing their thing (hence the saying busy as a bee)so they won't bug you like they do during apple picking in the fall when they're tired and cranky because they're hung-over after drinking all that fermented apple juice from rotting apples. And best of all, hiding in what looks like a simple sea of green leaves is a hidden treasure of the most beautiful fire-engine red fruit. Ok. Back to the jam. 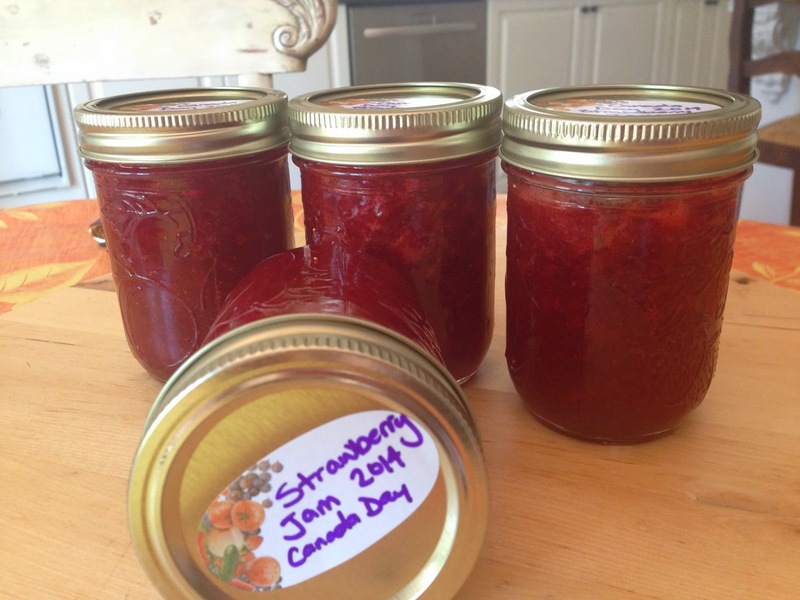 If you are going to make jam, the only tricky thing you need to consider is time. Freshly picked organic berries will start to spoil in less than 24 hours, even if refrigerated. So if you're planning on picking your own berries for making your own jam, it's best to do it all on the same day. Besides that, all you need is a package of pectin, some sugar (organic coconut sugar adds a subtle tropical taste), and enough jars to hold about 8 cups of jam. And that's it! Really! Three hours and three ingredients after I started, my jam jars will filled and my cupboard was once again filled.